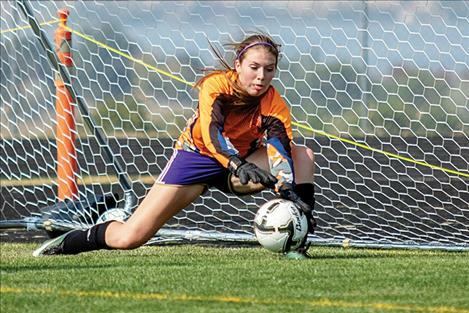 Lady Pirate goalie Megan Rost makes a save during the Billings Central match. Pirate Tray Lichtenberg takes a shot. 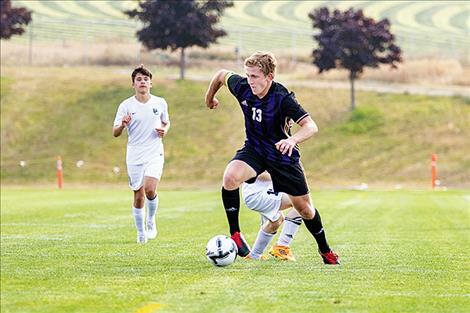 POLSON – Polson (4-0) staked its claim as one of the top soccer teams to beat in Class A this season. 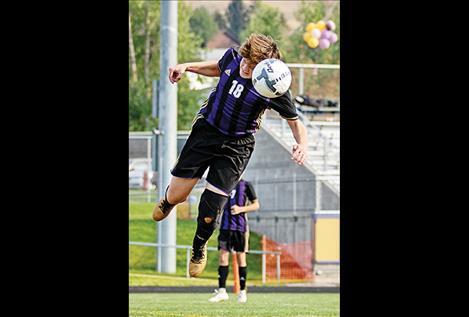 The Pirates remained undefeated after downing Billings Central 3-2 Friday and Laurel 2-1 Saturday at the Polson Sports Complex. Senior forward Mack Moderie has found his offensive mojo in a big way this season, scoring eight goals in the last four games to lead the Pirates in scoring. “Moderie has been incredible so far, scoring goals and creating chances for his teammates,” said Fansher. 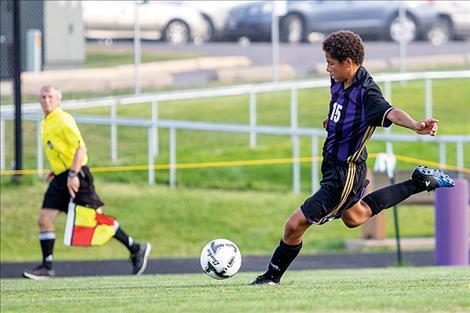 In the Pirate’s 3-2 win over Billings Central, Moderie netted two scores both from Robin Erickson assists and was credited with an assist in the Zevan Walker goal. Moderie found the back of the net twice on Saturday in the 2-1 win over Laurel. 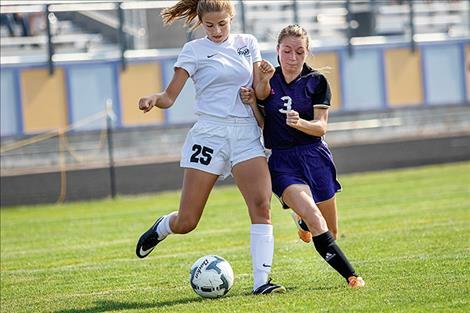 On the girl’s side of the pitch, Polson couldn’t keep pace with Billing Central’s high-powered offense as the Lady Pirates were shutout 6-0 on Friday. In Saturday’s game, the Lady Pirates held a 2-1 advantage over visiting Laurel at intermission with first period goals by Ali Hupka and Ashlee Howell. Each girl assisted in each other’s goals. Laurel knotted the score at 2-2 in the 71st-minute of the match. The Lady Pirates held tough until Laurel broke the deadlock with the go-ahead goal at the 76th-minute mark. The Pirates and Lady Pirates wrap up their four-game home-stand when Libby visits on Thursday and Columbia Falls on Saturday. First kick is scheduled for the boys on Thursday at 4 p.m. and 6 p.m. for the girls, while Saturday’s match-up for the boys starts at 5 p.m. and 7 p.m. for the girls.